Two suicide bombers detonated themselves during counter-terror operations in the capital Ankara early Saturday. The terrorists were reportedly planning a car-bomb attack and refused to surrender when the police told them to lay down their arms outside a horse farm in Ankara's Haymana district and blew themselves up. Security forces have not been injured in the attack, reports said. Later on in the day, security forces released a video recorded from an armored police vehicle, showing the moment when the terrorists blew themselves up. Speaking to the media, Ankara Governor Ercan Topaca said that one of the suicide bombers has been identified as Harun Arslan, and another one is a woman who was identified by Turkish media outlets as Mahide Ataş. The police suspect there might be a third suspect and are currently investigating. A total of 200 kilograms of ammonium nitrate and plastic explosives have been discovered by police, Topaca said and added that the police is trying to figure out where the terrorists were planning to carry out the attack. "So far the PKK link is not certain but current evidence indicates that Harun Arslan may have PKK links" the governor said, and noted that the structure and planning of the attack resembles the ones carried out by PKK terrorists. 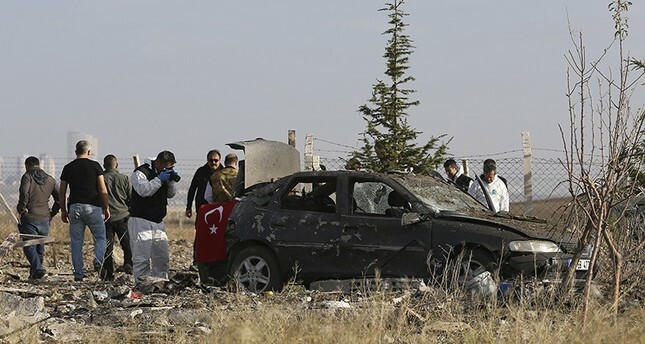 He continued by saying that the police received a warning from southeastern Diyarbakır province regarding a car bomb attack in Ankara and carried out anti-terror operations on Saturday, when the incident took place. On Thursday, an explosion near a police station rocked Istanbul's Yenibosna neighborhood, injuring at least 10 people. Later on the same day, six PKK members were detained, including the prime suspect, who is considered to be the "main perpetrator" of the attack, police said. The PKK, listed as a terrorist organization by the U.S. and the EU, resumed its 30-year armed campaign against the Turkish state in July 2015. Since then, over 600 security personnel, including troops, police officers and village guards have been killed and more than 7,000 PKK terrorists have been killed in operations across Turkey and Northern Iraq.